One of my favorite things of all time to do is to discover how to make things from scratch. It’s sometimes rather surprising how economical, and simple, it can be to make things the way people used to—back “in the old days”. I bake bread a few times a week (there is a hard and an easy way to make bread—I’ll post about the easy way sometime), but this past weekend Chris and I decided to create an accompaniment to it—namely, cheese. Like many people, I’d always assumed that it was not worth the effort—I believed you needed a plethora of fancy ingredients, instruments, boiling cauldrons and most importantly time, to come up with a piece of cheese you’d actually want to eat. But! Did you know that mozzarella cheese can be created within a couple of hours? Without needing the lab of a mad scientist? Check it out! Junket rennet tablets — these are used to make custard, ice cream and cheese. 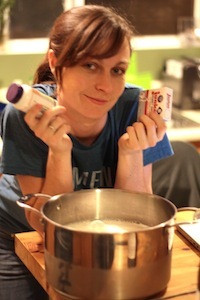 They coagulate the milk and separate it into curds and whey (like Little Miss Muffet!). You can buy them on Amazon for around $4, for enough to make 8 batches! Citric acid – this ripens the cheese, and can also be found on Amazon here for $6 for enough for….a lot of batches! The only actual instrument you’d need that you could potentially not have is a food thermometer. You can also buy these for a couple dollars online or at a grocery store. Other than that it’s bowls, a pot, strainer, spoons, etc. It takes a few hours to sit around and let the cheese do all it’s various things, but there isn’t much actual work involved. And essentially you spend around $3 per batch, have a roaringly good time with your hands in cheese, and end up with a huge ball of delicious mozzarella! The easiest instructions (with pictures) that we found were these ones. 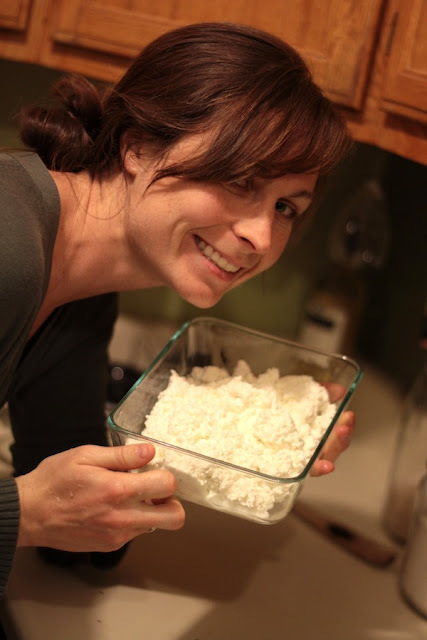 We threw away the whey that came off the milk, but you can actually use that to rather easily make ricotta cheese!